A phone won't connect via Bluetooth® during intial pairing or regular use if the speaker is plugged into the charging cable. For the speaker to be paired to a phone, it must be charged, powered on and taken out of shipping mode. The OBD reader must be installed in the car and within 10 feet of the speaker. 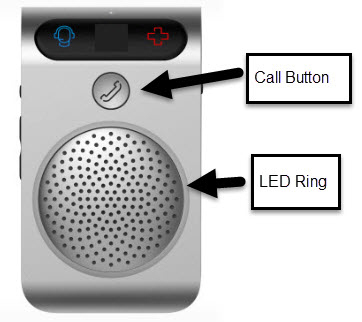 Press and hold the Call button for about 3 seconds or until the LED ring around the speaker begins to flash blue. For the phone you are pairing, go to settings to turn Bluetooth on and search for other Bluetooth devices. Tap Hum from the search results on the phone. If prompted for a PIN (passkey), enter 0000. The flashing blue LED on the speaker turns solid for about 15 seconds to indicate the phone has been paired successfully. For more info, check out these Bluetooth FAQs and Hum FAQs.